What constitutes perfect party food? It should be temptingly delicious, plentiful and the perfect accompaniment to the drinks being served. If this sounds like a tall order to you, don't be alarmed. Tasty canapés and side dishes do not have to be prepared by a Michelin star chef. Keep it simple. Remember this and make it your mantra. Party food is not the focal point of the gathering - if it were, you would be hosting a dinner party. It is merely a side dish, designed to satisfy the appetites of your guests. As a result, you needn't spend hours slaving away in preparation. 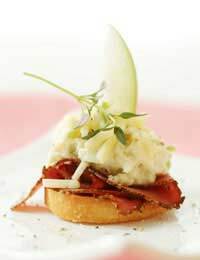 If you keep it simple and opt for classic canapés, you will have more time to think about other party-related matters. All you'll need is a well thought out shopping list and a couple of hours of preparation time. The fatal error at any event you are hosting is to serve copious drinks and then skimp on the food. This could spell disaster, not least for those guests who are enjoying the intake of alcohol without anything there to soak it up. Pre-made blinis are a party organiser's godsend. Available at your local supermarket, they are incredible versatile. Simply warm them up and apply any topping of your choosing. Think along the lines of melon wrapped in prosciutto or some small mozzarella and avocado sections placed delicately on the top. Hard to resist and easy to prepare, vegetable dippers are popular for all party guests. Carrot, celery and cucumber are the classic choices. Present alongside a selection of dips including hummus, guacamole and salsa. Slice an aubergine into thin, long slices and drizzle with olive oil. Place a small section of goat's cheese in the middle and wrap the aubergine slice around it. Bake in the oven for 20 minutes and serve. Be ingenious with your party menu. Make the canapés small and easy to manage, No one wants to be seen stuffing anything into their mouth and the act of doing so frequently interrupts the flow of conversation. Consider doing something different. Hollow out tomato shells and fill with hummus or if time is on your side, create mini portions of chips. Salad leaves such as radicchio and endive make great bases for wrapping. Try and remember that party food should be simple and plentiful. If you really think about it, a canapé only really consists of a base and a topping and there are few rules that you need to follow. Life may be too short to spend stuffing mushrooms so feel free to take all the shortcuts you need to.